JSON-LD is described pretty well at https://json-ld.org/ and the specification can be found at https://json-ld.org/latest/json-ld/ . The website https://json-ld.org/playground/ is also useful. There are many reasons for working with JSON-LD. The major search engines such as Google require ecommerce companies to mark up their websites with a systematic description of their products and more and more companies use it as an easy serialization format to share data. The benefit for your organization is that you can now combine your documents with graphs, graph search and graph algorithms. Normally when you store documents in a document store you set up your documents in such a way that it is optimized for direct retrieval queries. Doing complex joins for multiple types of documents or even doing a shortest path through a mass of object (types) is however very complicated. Storing JSON-LD objects in AllegroGraph gives you all the benefits of a document store and you can semantically link objects together, do complex joins and even graph search. A second benefit is that, as an application developer, you do not have to learn the entire semantic technology stack, especially the part where developers have to create individual triples or edges. You can work with the JSON data serialization format that application developers usually prefer. 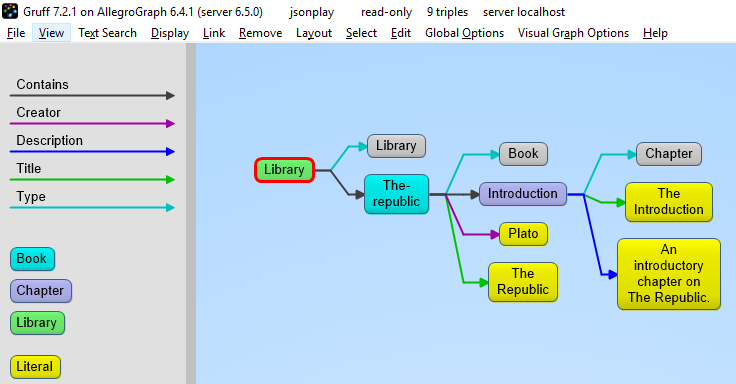 In the following you will first learn about JSON-LD as a syntax for semantic graphs. After that we will talk more about using JSON-LD with AllegroGraph as a document-graph-store. You can use Python 2.6+ or Python 3.3+. There are small setup differences which are noted. You do need agraph-python-101.0.1 or later. Mimicking instructions in the Installation document, you should set up the virtualenv environment. If the script runs successfully a new repository named repo will be created. We next define some utility functions which are somewhat different from what we have used before in order to work better with JSON-LD. createdb() creates and opens a new repository and opendb() opens an existing repo (modify the values of host , port , user , and password arguments in the definitions if necessary). Both return repository connections which can be used to perform repository operations. showtriples() displays triples in a repository. The first object we will create is an event dict. Although it is a Python dict, it is also valid JSON notation. (But note that not all Python dictionaries are valid JSON. For example, JSON uses null where Python would use None and there is no magic to automatically handle that.) This object has one key called @context which specifies how to translate keys and values into predicates and objects. The following @context says that every time you see ical: it should be replaced by http://www.w3.org/2002/12/cal/ical#, xsd: by http://www.w3.org/2001/XMLSchema#, and that if you see ical:dtstart as a key than the value should be treated as an xsd:dateTime. We also create a test function to test our JSON-LD objects. It is more powerful than needed right now (here we just need conn,addData(event) and showTriples() but test will be useful in most later examples. Note the allow_external_references=True argument to addData() . Again, not needed in this example but later examples use external contexts and so this argument is required for those. Note in the above that we now have a proper subject and a type. 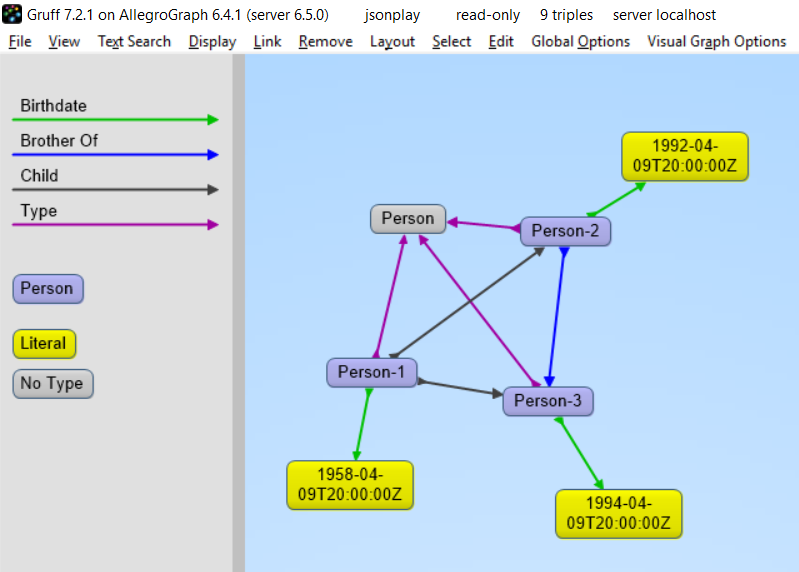 The next object we add to AllegroGraph is a person object. This time the @context is not specified as a JSON object but as a link to a context that is stored at http://schema.org/. Also in the definition of the function test above we had this parameter in addData: allow_external_references=True. Requiring that argument explicitly is a security feature. One should use external references only that context at that URL is trusted (as it is in this case). We start by forcing a key’s value to be stored as a resource. We saw above that we could specify the value of a key to be a date using the xsd:dateTime specification. We now do it again for foaf:birthdate. Then we created several linked objects and show the connections using Gruff. The following shows the graph that we created in Gruff. Note that this is what JSON-LD is all about: connecting objects together. Here is an example from the wild. The URL https://www.ulta.com/antioxidant-facial-oil?productId=xlsImpprod18731241 goes to a web page advertising a facial oil. (We make no claims or recommendations about this product. We are simply showing how JSON-LD appears in many places.) Look at the source of the page and you’ll find a JSON-LD object similar to the following. Note that @ directives go to any level. We added an @id key. 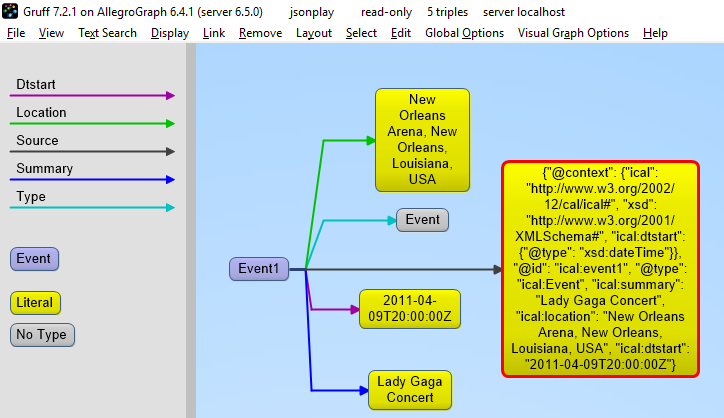 One can put one or more JSON-LD objects in an RDF named graph. This means that the fourth element of each triple generated from a JSON-LD object will have the specified graph name. Let’s show in an example. Note that the fourth element (graph) of each of the triples is <http://franz.com/place1>. If you don’t add the @id the triples will be put in the default graph. So far we have treated JSON-LD as a syntax to create triples. Now let us look at the way we can start using AllegroGraph as a combination of a document store and graph database at the same time. And also keep in mind that we want to do it in such a way that you as a Python developer can add documents such as dictionaries and also retrieve values or documents as dictionaries. Let’s use our event structure again and see how we can store this JSON document in the store as a document. Note that the addData call includes the keyword: json_ld_store_source=True. The jsonld_tutorial_helper.py file defines the function store as simple wrapper around addData that always saves the JSON source. For experimentation reasons it also has a parameter fresh to clear out the repository first. If we look at the triples in Gruff we see that the JSON source is stored as well, on the root (top-level @id ) of the JSON object. For the following part of the tutorial we want a little bit more data in our repository so please look at the helper file jsonld_tutorial_helper.py where you will see that at the end we have a dictionary named obs with about 9 diverse objects, mostly borrowed from the json-ld.org site: a person, an event, a place, a recipe, a group of persons, a product, and our hippieoil. First let us store all the objects in a fresh repository. Then we check the size of the repo. Finally, we create a freetext index for the JSON sources. To simply retrieve values in objects but not the objects themselves, regular SPARQL queries will suffice. But because we want to make sure that Python developers only need to deal with regular Python structures as lists and dictionaries, we created a simple wrapper around SPARQL (see helper file). The name of the wrapper is runSparql. Here is an example. Let us find all the roots (top-level @ids ) of objects and their types. Some objects do not have roots, so None stands for a blank node. We do not see the full URIs for ?s and ?type. You can see them by adding an appropriate format argument to runSparql, but the default is terse. retrieve is another function defined (in jsonld_tutorial_helper.py) for this tutorial. It is a wrapper around SPARQL to help extract objects. Here we see how we can use it. The sole purpose of retrieve is to retrieve the JSON-LD/dictionary based on a SPARQL pattern.